One man! Just one man! The ﻿Philadelphia Phillies, the best team in baseball throughout the 2011 baseball season, have fallen to the St. Louis Cardinals by a score of 1-0 in the fifth and deciding game of the National League Division Series (NLDS) between the two teams. The loss places the Phils out of contention for the World Series ring that had seemed so within reach just a few weeks ago and plunges the entire City of Philadelphia into darkness! "I'm flabberghasted!" 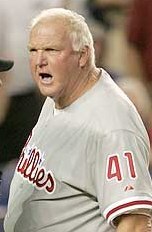 said Phils' Manager Charlie Manuel. "How can one man --- one solitary Phillies fan --- be so totally unworthy as to sink an entire baseball team?!" "You'd think Fate would have erred in favor of benefitting the undeserving loser rather than punishing an entire team and City," said Phils' ace Roy Halladay, who was charged with the loss. "I guess Fortune works in strange ways." The City of Philadelphia is poised to file legal action against Mr. Block as soon as a reasonable cause of action can be determined. "Oh, we'll get him!" vowed a visibly shaken but determined Mayor Michael Nutter, "We'll get him! Our best attorneys are researching guilt, bad karma, and annoying shlemiel as we speak!" For his part, Mr. Block was in seclusion and offered no comment. An acquaintance of Mr. Block who spoke on condition of anonymity and that we print that he is a remote acquaintance of Mr. Block who doesn't even really like the guy said "Well, how do you think he'd feel after all this?" "My guess is that he feels one tiny little bit even less worthy than ever before..."
I was sitting in our local (St. Louis) suburb's pizza place last night when the game ended. I nearly decorated my wife with Canadian bacon and mushrooms. Well, Glynn, looks like you have me to thank for it! Can I hide out in your place in St. Louis until the bad karma has blown over? I was just getting ready to tell you come on down to Cardinal country, Perry. We'll throw you a parade. "Oh, he's got jolly bad karma, he's got jolly bad karma ..."
Well, I was thinking more along the lines of rich people throwing money at you and beautiful girls running out in the street and showering you with kisses and adoring gazes. But, whatever . . .